Under the heading "A Palestinian Terrorist", the New York Times carries a letter in today's edition written by Frimet Roth. Frimet's comments relate to a film review described in an earlier blog entry on this site, entitled "About sweet-faced women". I wonder when the photo of Ahlam Tamimi was taken. Perhaps when she learned that the bombing of Jerusalem’s Sbarro restaurant had killed 15 and not 8, as she had presumed. She helped execute that massacre and actually smiled upon hearing that. 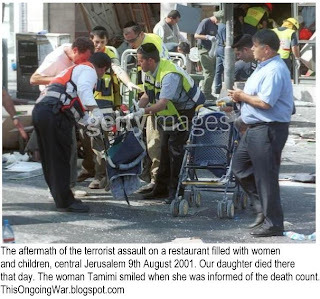 Ms. Tamimi decimated one family — a mother, a father and three of their eight children; robbed another American couple of their only child, pregnant with their first grandchild; and ended the life of my beautiful, kind 15-year-old daughter, Malki. The photo reinforced Mr. Genzlinger’s message: There is no black or white here. Just intransigents playing at “cat and mouse.” But he did not mention this: Hundreds of Israeli children have been targeted and murdered in playgrounds, on school buses and in pizza shops. Their murderers were not freedom fighters or militants or attractive young women. They were simply evil people who, like Ms. Tamimi, enjoy murdering children and babies. For more about what she and her co-conspirators did, please refer to "A Life of Beauty" (describing our daughter) and "An Act of Barbarism".